Use this tower to keep your small- or medium-size business on track, even when the power doesn't cooperate. The unit comes with PowerChute Business Edition software to prevent data corruption during prolonged outages, and SmartConnect helps you view system status from your mobile device. Prevent outages, spikes and surges from corrupting data and ruining your servers, switches, routers and networking devices. 6' cord allows extended reach. 10 outlets are surge protected to keep your electronics from damage. SmartConnect uses the cloud to let you view backup status from your handheld, mobile devices. Provides firmware updates, automatic notifications and advanced support. LCD is easy to read and features intuitive navigation keys and real-time status updates. PowerChute Business Edition software allows safe system shutdown should your power be out for an extended amount of time. Pure sine wave output offers compatibility for active Power Factor Corrected servers and sensitive electronics. Automatic Voltage Regulation (AVR) keeps voltages at a safe level. Green mode uses less battery power for efficient operation. Predicts when your battery will need to be replaced. Backed by the manufacturer's $150,000 connected-equipment guarantee. 3-year limited warranty on the unit and 2-year limited warranty on the battery. The SMT3000C comes with our innovative remote cloud monitoring solution, APC SmartConnect, a feature which allows you to view the status of your UPS on a secure web portal via any internet connected device. 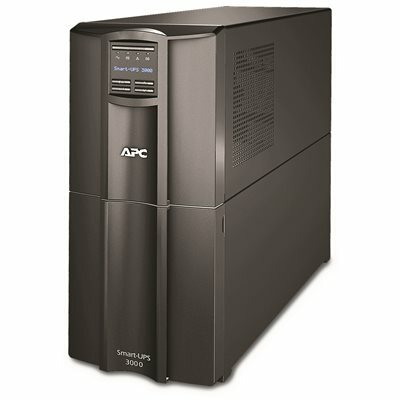 APC SmartConnect maximizes the life and performance of your UPS through automatic notifications, firmware updates, and advanced support. The bright, easy-to-read LCD interface provides real-time status updates of your APC UPS with multiple language options, and intuitive navigation keys.